Built for performance, our range of petrol lawn mowers is designed to give you all the power you need, while freeing you from the constraints of cables, meaning you can tackle large expanses of grass with ease. If you decide a fuel-powered machine is the right choice for your lawn, pitch, or any other grassed area, you’ll need to narrow down your options to ensure you make the right choice. Petrol rotary lawn mowers are versatile all-rounders, and one of our most popular options, but we also offer flail mowers for tough overgrown areas, scythe mowers to tackle long grass in paddocks, and even hover mowers for gliding over sloping terrain. Should you wish to achieve the classic striped effect on your lawn, you’ll also need to pick a petrol lawn mower that comes complete with a rear roller. From wide cut lawn mowers that make light work of large areas, to entry-level petrol rotary mowers with vertical storage options, The Green Reaper ticks all the boxes for garden maintenance. 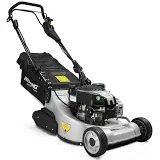 Browse the categories below to find hundreds of petrol lawn mowers from leading brands, and pick out the perfect machine for you and your lawn. A great all-rounder for your average front and rear lawn, our petrol rotary lawn mowers offer true flexibility with cutting, collection and mulch options. Create a classic striped lawn worthy of Wimbledon. Our powerful petrol rear roller lawn mowers will help you achieve a perfect finish to your grass. Lightweight and versatile, petrol hover mowers are ideal for sloping banks and other awkward terrain. Achieve a precise cut with minimum effort. Helical blades on petrol cylinder lawn mowers deliver outstanding results time after time. A scythe mower is a powerful machine designed to tackle the specialist tasks of cutting back undergrowth in paddocks, orchards and wild meadow. Hard to reach overgrown areas? No problem. Wheeled trimmer mowers will give you the access you need to trim under fences, along walls and around trees. Power through weeds, tall grass and even saplings with a sturdy all terrain field and brush mower, designed for any environment. Big brush clearance jobs require heavy-duty flail mowers. These self-propelled and towed models will tackle any terrain, vegetation or topography. A low centre of gravity make wide cut lawn mowers the perfect choice when you need a serious walk-behind machine to tackle grass verges.